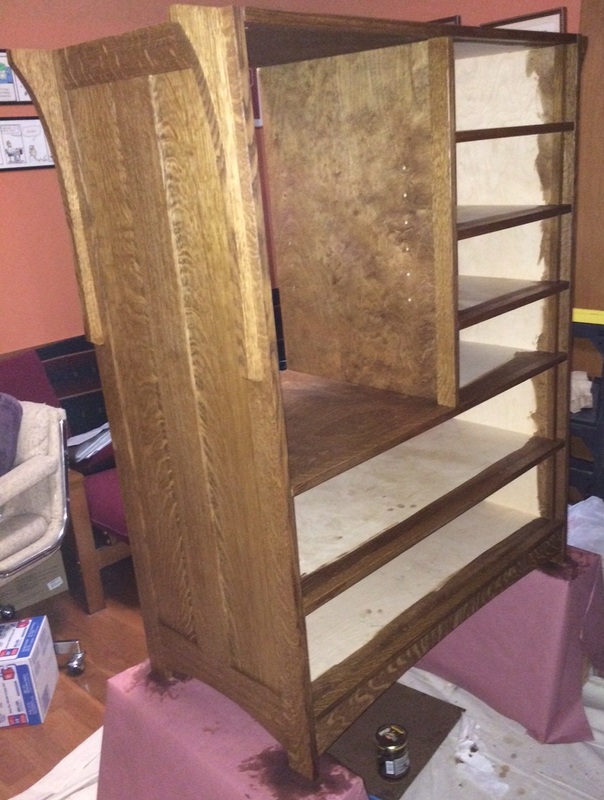 Monday evening after work and before cooking dinner I put the Dark Walnut Watco Danish Oil on the dresser case. I worked my way around the case working in sections. It isn't terribly important with the Danish oil to keep a wet edge but by working methodically in a pattern I could make sure I got all the surfaces covered. You can see that I didn't put the oil on the inside of the drawer cases.They are going to be hidden by the drawers so why waste the oil. Also, I am a bit low on the oil and I'd like to finish this project on the current can. It will give me a better odds of having a consistent finish. I pretty much follow the instructions for applying the oil. I flood the surface with the oil using a shop towel. I try to keep it pretty neat but you can see the dark stains around the feet which is why I covered the saw horses with felt. If any spots look like they have absorbed all the oil I'll put a little more on. After thirty minutes I put a second coat on following the same pattern. After another fifteen minutes, it is time to wipe off any excess. I basically take a clean shop towel and wipe down the entire piece. I do this until the surface doesn't feel sticky any more. At this point the instructions say you can use the item after 48 hours of put a top coat such as polyurethane on it after 72 hours. I'll be giving it at least twice that. All oil based finishes - at least the ones I know of - need to cure which is distinctly different from drying. Finishes which cure are undergoing a chemical reaction which is typically a temperature sensitive exothermic - puts off heat - reaction. The warmer the environment the faster the finish cures. This is why you should never wad up wet oily rags and throw them in a trash can. The oil starts curing generating heat which trapped by the wadding and garbage can causes the reaction to accelerate which generates even more heat and so on until something reaches the temperature where it will spontaneously combust. Anyway, I'm very careful to dispose of my rags carefully so I don't burn down my house but almost as important I don't know how fast the oil on the case is going to cure. Since it is a bit chilly in upstate New York right now I'm going to wait to make sure the oil is cured. If the oil isn't cured when I try to put the polyurethane on I'll just end up with a muddy blurry mess. There's one more issue. Oak has really large pores which absorb the oil. Over the first few days the oil in the pores will leak out. If I don't keep going back to the project and wiping it down a few times a day I'll get a blotch wherever the oil leaks. I wiped the case down twice again Monday night. I wiped it down twice on Tuesday, once in the morning and once in the evening. Wednesday I overslept so I didn't have time in the morning but I'll wipe it down before I head to bed tonight. So I am going to wait at least 72 hours after the oil stops leaking out and I consistently get a clean rag when I wide the case down.